Menulog delivers for Sidnees Woodfired Pizza so you'll be able to track your courier on a map. Italian rice balls in bread crumbs with blue cheese sauce. Lightly floured fried squid with mixed leaf and mango sauce vierge. Pomodoro, buffalo, oregano and basil. 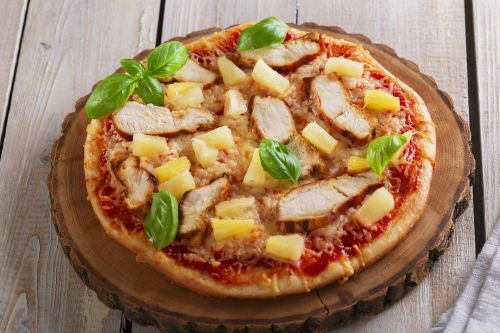 Napolitano sauce, mozzarella, chicken, pineapple, onion and oregano. BBQ sauce, mozzarella, chicken, mushroom and Spanish onion. Napolitana sauce, mozzarella, chicken, mushroom, Spanish onion and peri peri on top. Napolitana sauce, mozzarella, Parmesan and parsley. Napolitana sauce, mozzarella, mushroom, ham, mozzarella, salami, Spanish onion, oregano and parsley. Pomodoro, mozzarella, pepperoni and oregano. Red sauce, spicy salami, roasted capsicums and olives. BBQ sauce, mozzarella, ham, salami, bacon, sausage mince, pepperoni, oregano and parsley. Napolitana sauce, mozzarella, mushroom, Spanish onion, ham, salami and olives. Pomodoro, mozzarella, anchovies, smoked ham, mushrooms and olives. Garlic paste, olive oil, mozzarella, prawns and parsley. Pomodoro, mozzarella, snow peas, mushroom, capsicum, rocket, zucchini flower, semi-dried tomatoes, onion, olives and oregano. Napolitana sauce, fresh capsicum, eggplant, semi-dried tomato, cherry tomato, mozzarella and fresh chilli. Napolitano sauce, mozzarella, roasted capsicum, olives, sausage mince, parsely and oregano. Napolitano sauce, mozzarella, mushroom, artichoke, ham, salami, parsley and oregano. Napolitano sauce, mozzarella, octopus, prawns, squid and basil. Napolitano sauce, mozzarella, salmon and basil. Napolitano sauce, mozzarella, barramundi and basil. Napolitano sauce, mozzarella, chorizo, prawns, parsley and oregano. Homemade tender schnitzel served with chips and salad. Homemade schnitzel with eggplant and Cheddar cheese slices topped with Napolitana sauce and parsley served with chips and salad. Grilled chicken breast topped with mushroom and creamy garlic sauce served with chips and salad. Grilled chicken breast topped with creamy green pepper sauce and shallots served with chips and salad. Served with chips and salad or mash and vegetable with tartare sauce. Beef mince, Napolitano sauce and parsley. Homemade tender schnitzel served with chips. Battered fish with chips and tomato sauce. Seasonal vegetables, garlic, spring onion, Parmesan cheese and cream. Medley tomato, spring onion and Parmesan cheese. Beef mince, Napolitana sauce and parsley. Mushroom, spring onion, Parmesan cheese and cream. Chicken, slow cooked arborio rice, mushroom, cream, butter, Parmesan cheese and parsley. Slow cooked pulled beef, spring onion, Parmesan cheese and Napolitana sauce. King prawns, chilli, garlic, spring onion, Parmesan cheese and Napolitana sauce. Feta, tomato, cucumber, Spanish onion, cos lettuce, Kalamata olives, oregano and homemade Greek dressing. Grilled chicken, cos lettuce, bacon, croutons, Parmesan cheese, egg and Caesar dressing. Oven roasted pumpkin, mixed leaf, grilled halloumi, pumpkin seed, pine nuts and house dressing. Baby spinach, mustard, pickled beetroot, walnut, almond flakes and extra virgin olive oil. Marinated grilled chicken, mixed leaf, tomato, cucumber, onion, avocado and honey mustard dressing. Grilled octopus, mixed leaf, tomato, cucumber, onion and vinaigrette dressing. Mixed leaf, tomato, onion, cucumber and house dressing. Banana, strawberry, caramel syrup and icing sugar. Nutella, strawberry and icing sugar.